The first of July marks the beginning of a new year in Rotary and celebrates the changeover of presidents in Rotary Clubs all over the world. It’s that time of the year when the baton is handed over with great pomp and celebration to a new president in what could be described as one of the longest running relays of presidents of the world. 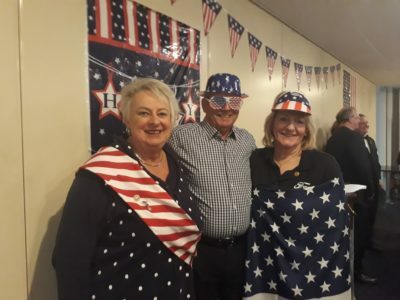 The Rotary Club of Somerville recently hosted a changeover party at Howick RSA with a 4th of July theme. The top brass of Rotary including immediate past district governor (district 9920) Malini Raghwan and incoming district governor Ingrid Waugh were both present, as president Andrew Harvey handed over the bling to elected president Lisa James. American Independence Day was celebrated with guests dressed up in red, white and blue stars and stripes, and Donald Trump face cut-outs. Also spotted were Wonder Woman, Pocahontas and the Statue of Liberty. Past District Governor Dr Philly Karani gave an informative overview of Rotary, including the four-way test and polio eradication. Two charter members Colin Botherway and Gerald Patterson took a nostalgic trip down memory lane to talk about the journey of the vibrant club from then to now. 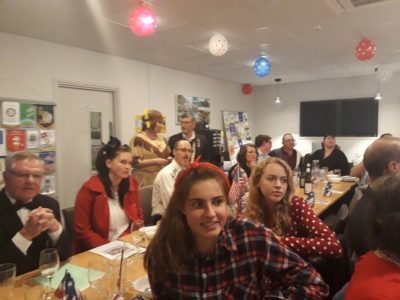 A quiz by Mike Williamson challenged everyone’s knowledge of American history and even orchestrated a sing-along of American Pie and Star Spangled Banner; while the dapper Master of Ceremonies Tony Peacock kept the tempo going with light-hearted banter. “Andrew will be remembered for bringing lots of women to the club,” he joked about the fact that Rotary Club of Somerville is one of the few clubs in the country that boasts 52 per cent female membership.